If I recall correctly, Krishnavatara II, sections 10 and 11 are about Krishna and Uddhava going to Nagaloka (current Nagaland ??) and Uddhava getting entangled with a Nagakanya!--Sriram. 'Naga Lore' would fill countless volumes. The fear and the fascination for snakes is instinctive and would go right back to the beginning of human evolution. We would have shared, surely not by choice, the same safe dwellings in those prehistoric times. There would have been snake bites and deaths, certainly by accident. In Mahabharata the great grand son of Arjuna, Janamejaya performs a snake sacrifice. 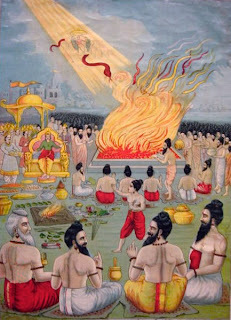 It is said that the story of his ancestors, Mahabharata, was recited to him at the time of this snake sacrifice. Janamejaya was intent on wiping out snakes altogether to avenge the death of his father, who died because of a snake bite. Obviously the priests who officiated had no concerns about its effect on earth's ecology. Shalya after comforting Yudhisthira takes his leave. Later kings Satyaki, Dhrishtaketu, Jayathsena, Pandya and more join the pandavas along with their forces. The army thus added totals up to seven Akshohinis. Duryodhana is supported by Bhagadatta, Bhurishravas, Jayadhrata and many more. Hastinapura full with the forces overflows into the nearby forests, desert, the hills and the river banks and the entire area is totally packed. While the opposing sides are building up, the priest who was sent by Drupada to meet the kauravas reaches Hastinapura and meets Bheeshma and others. After the usual formalities of enquiring of each others well being, the priest addresses the assembled chiefs of the various armies.